If you’ve read Jane Mayer’s deep dive into the ties between the Koch Bros. and the Vice President, “The Danger of President Pence,” you’ll understand why it’s the high-water mark of reporting about their relationship. Yet there are several facts that aren’t included in the New Yorker article. Here are five facts worth knowing in addition to her excellent work. Fact #1: the No Climate Tax Pledge was a key tool for the Kochs to turn what had previously been a bipartisan issue into a weapon that ignores the science behind climate change and helps the bottom line of Koch Industries. 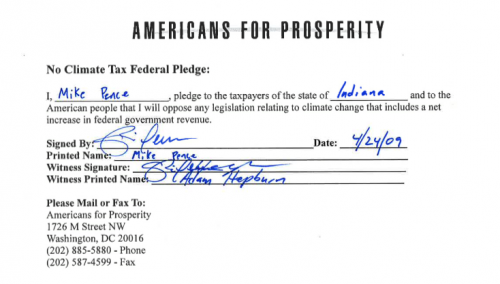 The No Climate Tax Pledge was issued by Americans for Prosperity, which is itself controlled by the Kochs and funded by them and their network of donor allies. The pledge claimed that it would “draw a line in the sand” to guard against “unrestrained growth in government at taxpayers’ expense hidden under the guise of environmental correctness.” Yet a climate tax that would tax fossil fuel carbon pollution has bipartisan support — even by Exxon — as the most efficient way to solve the problem of a rapidly heating planet. Once Mr. Pence signed onto the Pledge on April 24, 2009, the number of U.S. House Republican Party members signing mushroomed from 13 to 156 by the November 2010 election. Ninety percent of the 85 House freshmen elected in November 2010 had also signed it. Of these, 57 of them had received contributions from KochPAC. During this period, Mr. Pence was chairman of the House Republican Conference. His duties included presiding over conference meetings composed of all members of the Republican party. 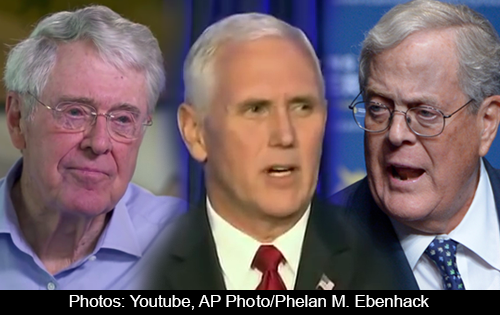 Since signing the Pledge, David Koch has demonstrated his appreciation by giving more money to Mike Pence than any other candidate. This includes $200,000 to Mike Pence when he ran for governor of Indiana (along with his running mate for Lt. Governor Sue Ellspermann) in 2012, $100,000 to Pence individually in 2016 (before he “withdrew” to run for Vice President), and nearly $10,000 in political contributions from Koch Industries for his gubernatorial runs since 2011. These amounts do not include funding hidden through other sources, such as the Republican Gubernatorial Campaign Committee. 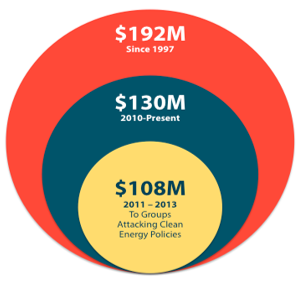 Fact #3: Koch Industries is increasingly exposed to disruptive growth by the clean energy sector. That’s why the Koch Bros. have been boosting funding to stop climate solutions technology, while the planet heats alarmingly. Koch Industries participates in industrial processes that transform raw fossil fuels into usable goods. It had the tenth largest oil processing capacity in the U.S. as of June 2015 — more than 600,000 barrels per day at refineries located in Corpus Christi, Texas, and Saint Paul, Minnesota. More than 2,000 miles of company pipelines transports crude oil and another 1,200 miles carries refined or petroleum products. Koch Industries also operates over 4,000 miles of hazardous liquid pipelines across Iowa, Illinois, Minnesota, Missouri, Texas and Wisconsin, as reported in 2014 to the Pipeline & Hazardous Materials Safety Administration. Overall, Koch Industries has 18 divisions and 249 sub-divisions, according to research conducted by Checks and Balances Project. 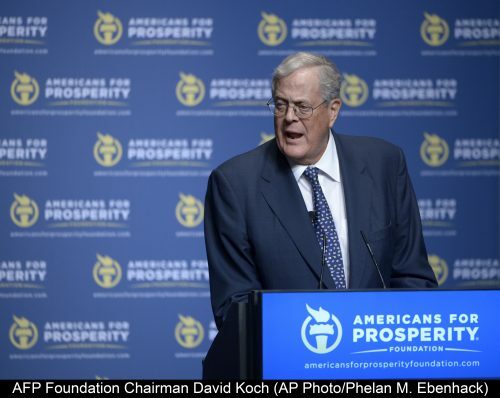 The Koch family, primarily Charles and David, obtained more than 80 percent of the common stock of Koch Industries and 88 percent of its voting stock following the buyout of dissident shareholders in 1983. Charles Koch has served as Chairman and Chief Executive Officer of Koch Industries since the death of his father, Fred Koch, in 1967. David Koch joined the company in 1971 and serves as Executive Vice President and a member of the board. Now, according to the Bloomberg Billionaires Index, Charles and David Koch are together the wealthiest people in the world, with a combined fortune of $95.4 billion. The second largest private company in the U.S., Koch Industries International had annual revenue estimated in 2015 at $115 billion. Yet the Koch empire is increasingly exposed to disruptive growth by the clean energy sector. 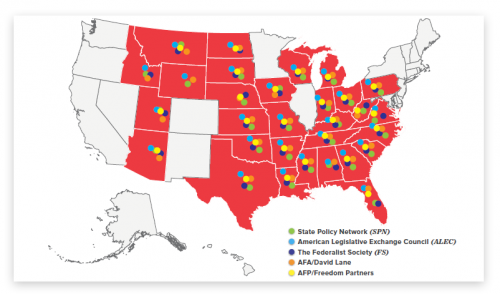 $108 Million to At Least 19 Groups to Fight State Renewable Energy Policies 2011-2013. C&BP has further uncovered new evidence of how the Koch Bros. use grantmaking groups to drive these attacks on climate change solutions, rather than doing so openly. Our investigation shows that the financial interests of Koch Industries are inextricably aligned with Americans for Prosperity, Freedom Partners Chamber of Commerce and other elements of the Koch Advocacy Network. Their energy and natural resource businesses are dependent on state and federal laws and regulations and virtually all their advocacy and political investments are strategically designed to assure favorable laws and limit regulatory enforcement. Known as “libertarians, “proud to be “free market” advocates, dismissive of government taxes and regulations, the Koch Brothers have built enormous political power on the federal, state and local levels to protect their private interests and to expand their personal wealth exponentially. “We’ve drawn a line in the sand and made it clear that the state of Indiana will not comply … We’ll avail ourselves of all legal remedies. On November 11, 2016, President Trump replaced New Jersey Governor Christie with Vice President-elect Pence as chairman of his transition. Pence was ready. Shortly thereafter, he chose Pyle to head up the new Administration’s energy transition team. A roadmap to radically rewrite America’s energy future, written by Pyle, was uncovered the following month by the Center for Media & Democracy. It laid out a master plan of 14 policies — including withdrawal from the Paris Climate Agreement — that collectively amounts to a Koch Brothers wish list to boost the fossil fuel industry and cripple competitive climate change solutions. Today, the country is fixated on President Trump. Meanwhile, the Koch Brothers are getting stronger. Through the Vice President’s, who could soon become President, they are preparing for a final take-over of the federal government. Scott Peterson is executive director of Checks and Balances Project, a watchdog blog that seeks to hold government officials, lobbyists and corporate management accountable to the public. Funding for C&BP comes from sustainable economy philanthropies and donors.